ZeroUV sunglasses. Windsor skirt. Windsor necklace. Windsor earrings. Windsor shoes. Triangl swimsuit + bag. Daniel Wellington watch. A good watch is hard to find. A great one, nearly impossible. Luckily, Daniel Wellington has cornered the market on minimalist, quality watches. Their watches make a strong statement on their own but are simple enough to where they perfectly accessorize any outfit. They've been on my radar for quite some time now--I'm a fan of "masculine" leather watches and finding one (with interchangeable straps!) made for even my tiny wrist was such a win. Everything about this is perfect, I love the skirt so much! Cada dia amo mas tue estilooo!! 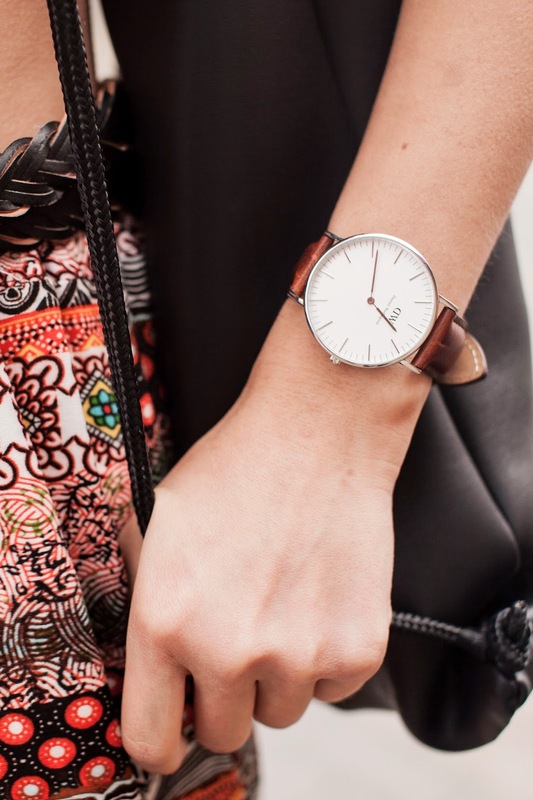 Love Daniel Wellington watches and your shoes! you look fab! What a perfect boho outfit! I love this one LAVV IT!